The gravel bottom fishways at the New Gloucester Fish Hatchery. The fish have a natural instinct to swim upstream. 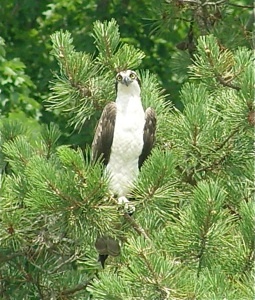 There is an osprey that seems to have adopted the hatchery as its home. 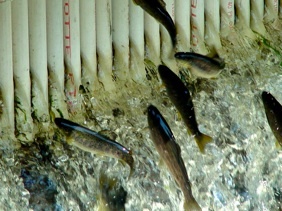 The catch basin provides water to the hatchery. 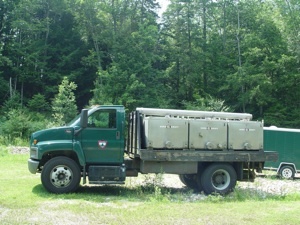 A stocking truck heads out to the many rivers, streams, ponds, and lakes in the southern two-thirds of the state with fish from the hatchery. Tim Knedler is the Fish Culture Supervisor at New Gloucester Fish Hatchery. What Makes New Gloucester Fish Hatchery So Unique? 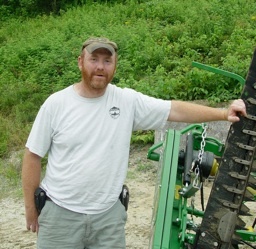 Several Maine farms who have chosen to diversify their operations often include innovative offerings at their farm that are recreational in nature. They might advertise hay rides, cross country skiing, a farm camp, or a petting zoo, along with several other agricultural pursuits, to bring in income for their farm. The entire focus of the New Gloucester Fish Hatchery is geared around one recreational venture. The staff at this fish farm raise and grow fish for the sole purpose of supplying fish for the sport of recreational fishing for resident and visiting anglers in the state of Maine. 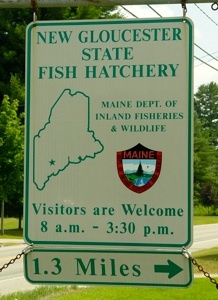 Access to the New Gloucester Fish Hatchery is accomplished by turning from Route 4/202/100 in New Gloucester. The old dirt road leading to the hatchery offers a dramatic contrast to busy Route 4/202/100. It is surrounded on both sides by woods and the visitor eventually ends up at a very verdant, remote, and peaceful property. 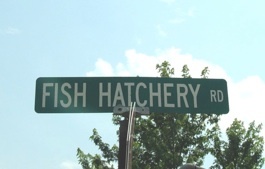 The hatchery address is 312 Fish Hatchery Rd. Access is accomplished by turning on Fish Hatchery Road from Route 4/202/100 and continuing 1.3 miles to the hatchery office. Although the public is welcome from 8-3pm daily, if you wish to schedule a tour please call ahead so this can be arranged (207) 657-3423. 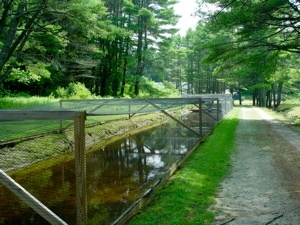 The New Gloucester Fish Hatchery is one of six fish hatcheries (Casco, Dry Mills, Enfield, Governor Hill, Grand Lake Stream), and two rearing stations (Embden, Palermo) (8 total facilities) run by the Maine Department of Inland Fisheries and Wildlife in the state. It is the only state hatchery that has natural gravel bottoms in the fish raceways. Brown trout are raised at the New Gloucester Fish Hatchery year round, and rainbow trout are raised during the winter months. Eddy Brook runs through the middle of the hatchery. 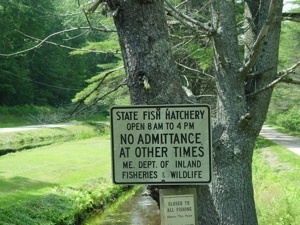 Although wild fish can be found in Eddy Brook, fishing in the brook is not allowed inside the hatchery grounds. The herons, osprey, raccoons, muskrat, and mink seem to have some difficulty in observing these no fishing rules on hatchery grounds! 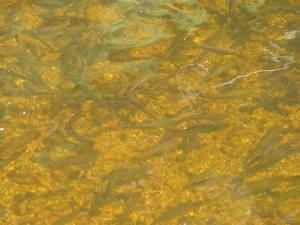 Fish predation at the hatchery can result in the loss of almost twenty percent of the fish population. The New Gloucester Inland Fisheries crew has become very adept in the repair of predator exclusion nets! Often even more challenging than predator problems at the hatchery are the situations that Mother Nature often poses. In periods of extreme drought and heat, the water levels and water temperatures are affected. The surprise Halloween snowstorm that dropped seven inches of the white stuff in late October 2012, wreaked havoc on the outside fish pens. Much of the netting collapsed, and if the situation had not been addressed immediately, dramatic fatalities could have resulted as fish can not survive when caught in netting. The hatchery crew was forced to slice 800 feet of netting down the middle. The herons had not yet migrated and they also could have conceivably enjoyed a significant one-of-a-kind free-for-all without the nets in place. There is a feeling of stepping back in time when you visit the New Gloucester Fish Hatchery. It was founded in 1932 as a Civilian Conservation Corps project. Due to the longevity of this operation, many of the wooden pens and structures needed to be rebuilt. The crew has dedicated a great deal of time and effort in addressing all the facets of the operation to keep it going in an efficient way while keeping costs down. They are “fix-it” experts. With the annual assistance of the work crew from the Windham Correctional Facility they have filled over 3,000 sand bags in the last five years to keep the sides of the fish runs from collapse due to erosion and also to discourage predators from entering. In the interest of saving money, the hard-working Hatchery staff attempt to tackle all the repairs and maintenance concerns that need to be addressed. Visitors not familiar with the workings of a fish hatchery might be very surprised to learn about all that is entailed in raising trout. Specific water flows, water temperatures, oxygen data, biomass, densities, and food amounts are critical to growth. Feeding typically takes place three times a day. The pvc screens in the raceways need to be continuously cleaned. Water flow/quality and effluent discharge must be monitored constantly. In October each year, the Hatchery staff conducts the spawning operation that takes place with 80-100 paired matings selected from 900-1000 three-year-old brood stock brown trout. Post fertilization, the eggs are placed in containers with pathogen-free well water and left to water harden for 1-2 hours. Next the eggs are dipped in a disinfecting solution for 15 minutes and then rinsed. Then egg size is determined and the eggs are enumerated before placement on egg trays which are stacked into aluminum troughs and submerged in flowing gravity fed well water in the “old” hatchery. The eggs continue incubating in the “old” hatchery until the eyes of the developing embryo appear as two small black dots that can be seen with the naked eye. This typically occurs in late November. At this point the viable eggs are moved to the “new” hatchery and situated in up to 25 Combi tanks supplied with pumped well water. Hatching typically occurs in December and the sac fry are able to start feeding in early January. There are automatic and belt feeders in the hatchery and the fish are fed round-the-clock for ultimate growth. The staff at the New Gloucester Hatchery is responsible for the incubation and fry rearing of all the brown and rainbow trout that are produced by the Department of Inland Fisheries and Wildlife. The typical annual brown trout production from the New Gloucester Fish Hatchery is: 35,000 8-10 inch spring yearlings, 23,000 12-14 inch fall yearlings and 950 retired brood stock that average 16-20 inches. These fish are stocked into lakes, ponds, streams and rivers over the southern two-thirds of the state. This requires over 150 individual stockings. 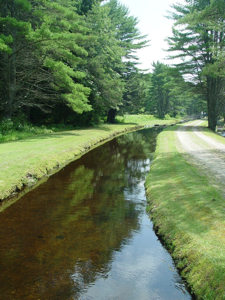 The New Gloucester’s Fish Hatchery’s primary focus is on growing brown trout and stocking various bodies of water with fish for men, women, and children who enjoy recreational fishing. The work that takes place at the hatchery contributes to various segments of the state’s economy. Because of the fish that are raised, some individuals have gone into selling bait or supplies for the anglers, pursued a career as a fishing guide, rented or sold boats for fishing, or provided accommodations or camping facilities for anglers. Fishing is a national pastime that can be enjoyed by individuals of all ages, backgrounds, and abilities. Once a fishing rod has been acquired and a fishing license has been purchased, the costs for enjoying this sport are minimal. It makes a great family activity. 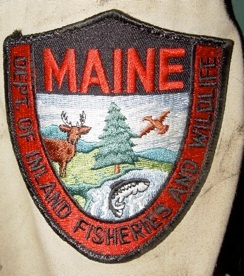 Maine residents under sixteen years of age and non-residents under twelve years of age may fish without a license. 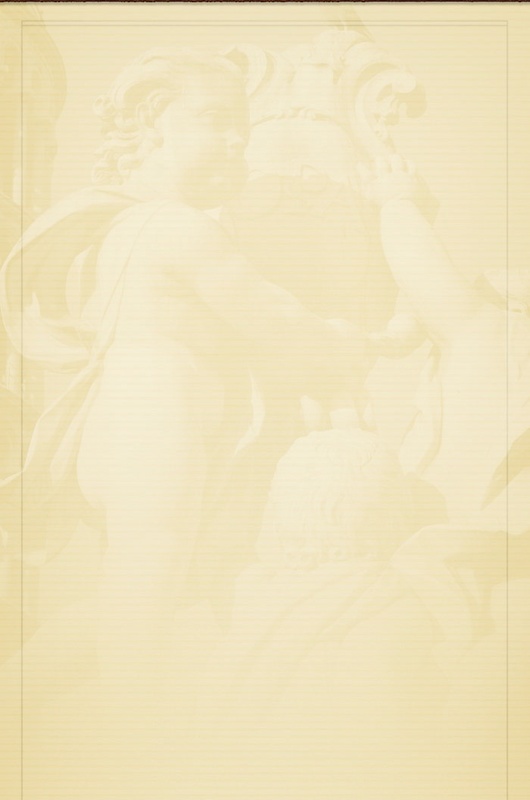 Complimentary licenses are distributed to individuals with various medical and special conditions. 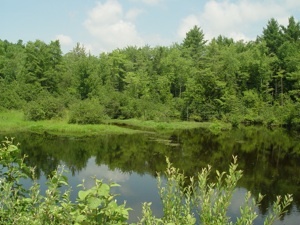 The state of Maine encourages residents and visitors to consider fishing. They have introduced open fishing days, the Hooked on Fishing program, educational programs, and even designated bodies of water as “Youth Only Fishing” spots. There are countless derbies and tournaments to enter and it is a sport that can now be enjoyed throughout the entire year. 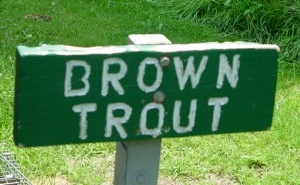 If one decides to take some time off and relax and enjoy some fishing in southern Maine there is a good chance that the brown trout you catch might have been raised and reared at the New Gloucester Fish Hatchery. Additional photos and information will be posted on these webpages when a return visit is made to the New Gloucester Fish Hatchery to document the spawning that takes place in October and the stocking of brown trout in the various bodies of water in the fall.